Instructions: Cut card base 6 x 6 inches in white card stock. Cut out the doily with the Daydreams Bridge Die in white cardstock and distress with Garden Patina ink, adhere to top of card base. Cut out teal cardstock to fit, distress and adhere. Cut out black cardstock slightly smaller, distress and adhere. Cut pale blue square piece of designer paper from the Cherry Blossom Retreat Paper Collection slightly smaller than the black mat, distress and adhere. Stamp the bridge scene from the Haven of Daydreams Cling Stamp Set and extra bridge in Jet Black on mixed media paper and color with Zig Markers, cut out extra bridge and adhere to bridge with foam tape for dimension, add Crystal Clear glitter to trees. Stamp bench from the Wishing Well Oasis Cling Stamp Set in Jet Black on mixed media paper and cut out with corresponding die, color with Zig markers. 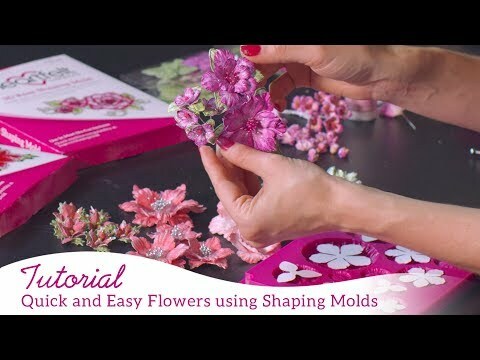 Stamp the flowers from the Tweet Cherry Blossoms Cling Stamp Set in Pearlescent Coral, sponge with same, cut out with corresponding dies and sculpt with the 3D Cherry Blossom Shaping Mold. Add prills to the centers of the flowers. Sponge blossoms with adhesive and cover with Crystal Clear. Stamp, and sponge leaves from the Tweet Cherry Blossoms Cling Stamp Set in Bamboo Leaves, cut out with corresponding dies and sculpt with the 3D Cherry Blossom Shaping Mold. Stamp the branches from the Cherry Blossom Retreat Die in Bamboo leaves and sponge with ink, cut out with corresponding dies. Mat the bridge scene on teal and then black card stock and adhere to card, adhere bench to left corner of scene. Adhere branches along the top of the scene and add the blossoms on top as shown. Cut out sentiment tag from the Cherry Blossom Retreat Paper Collection and adhere with leaves and flowers as shown, adhere more flowers around bench.